This week’s Sunday Supper theme is pork chops, and let me tell you, I have quite the collection! My cousins raise pigs occasionally and we usually buy one, so I am always looking for ways to cook them. Our favorite way is to just sprinkle with a Wildtree seasoning and pan fry, but sometimes you want something a little different. This recipe is super easy and you cut up the pork chop so it makes a stir fry. It cooks up nice and fast. In a large bowl, mix together rice wine vinegar, garlic, brown sugar, olive oil, and salt and pepper. Stir in pork pieces, cover, and leave at room temperature for 1/2 hour. Heat a large wok over medium heat. Toast almonds in hot, dry wok until golden brown and fragrant. Heat vegetable oil in wok over medium-high heat. Stir in marinated pork pieces, ginger, and chile paste. (Discard remaining marinade.) Mix in teriyaki sauce, and increase heat to high; cook, stirring constantly, until pork is white. Stir in peppers, and continue to stir fry until most of the liquid has evaporated. Top with toasted almond slivers and fresh mint. The Verdict: I can always tell when DH likes something because he will usually finish it and there will be no leftovers. There were no leftovers with this recipe! Which is kind of a bummer, because it would have been nice for lunch the next day. The flavors in this sound so bright and fresh! 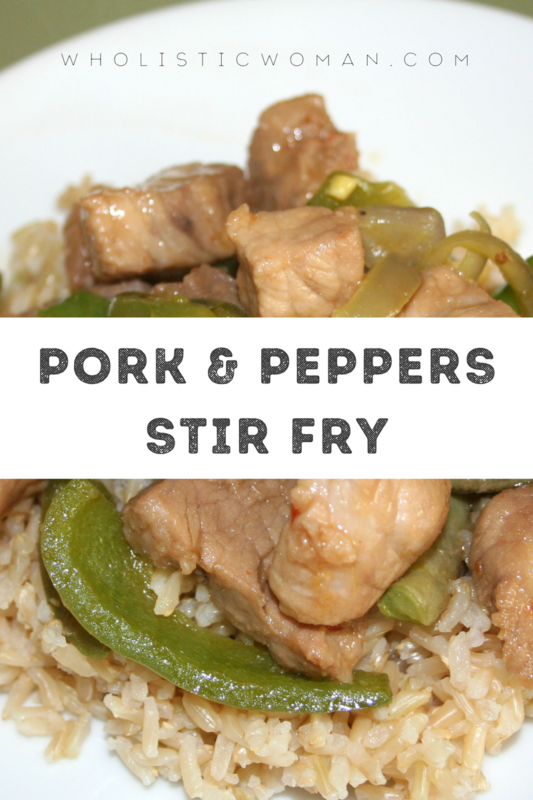 I wouldn’t have thought to make a stir fry with pork, but what a great idea! Stir fries are one of my favorite preparations. Fast, healthy, tasty and great for using up those odds and ends of veggies left in your fridge. Have you ever posted about buying bulk pork? I’m considering ordering a half pig from a local farmer, but I’m nervous about being able to use it all without running out of preparation ideas, what cuts to order, and storage. I would love to hear your take as a fellow busy lady with a two-person family! Hi there! Great post idea. We have ordered a pig or half a pig a few times. We have a separate stand up freezer and it takes maybe two shelves? The butcher was very helpful in helping us decide what to order. The nice thing is that we can have the hams cut to two-person size, and have pork chops packaged by twos. The biggest challenge for us is figuring out what to do with all the sausage, as it’s not something we normally use other than when we make the occasional big breakfast on the weekend.